A smart liquid that darkens dramatically in response to rising temperature has been developed by researchers at A*STAR. The nanowire-based thermochromic liquid's tunable color-changing behavior was retained even after hundreds of heat-cool cycles. This liquid could have applications ranging from smart windows to paper-based temperature sensors, the researchers say. Wu's research is focused on semiconductor nanocrystals, which form a colloidal suspension in certain solvents, and which are known for their broad light absorption and high photostability. "While exploring the synthesis of colloidal antimony selenide (Sb2Se3) nanoparticles, we serendipitously discovered that they formed crystalline nanowires upon heating and dissolved into their molecular precursors upon cooling, in a certain mixture of solvents," Wu says. Thanks to their broad light-absorbing behavior, a vial of Sb2Se3 nanowires formed by heating can appear very dark. But a solution of their molecular precursors, which the nanowires revert to upon cooling, are relatively transparent. 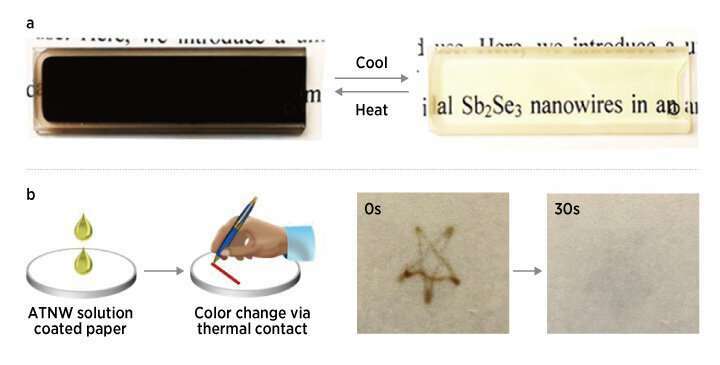 "This phenomenon formed the basis for developing these materials as liquid-based thermochromics," Wu says. The team showed that the thermochromic liquid's color-changing behavior is long-lived and robust. A solution of the molecular precursors was stable even after two years in ambient conditions, and could be heated and cooled hundreds of times without any loss of performance. An additional advantage was that the color change transition temperature could be tuned to be anywhere between 35 and 140 degrees Celsius by simply adding a small amount of tin chloride to the mixture. The tin species interact with the selenium precursor, reducing the temperature for nanowire growth. When the researchers coated their thermochromic solution on to filter paper, they showed that it could differentiate between cooler and hotter regions of an irregularly heated surface. "Our liquid-based thermochromic system potentially allows coating on to a large variety of surfaces," Wu says. One potential avenue is self-regulating windows that darken on hot days.